* Two, detailed 8.5" x 11" maps, that when placed together form the 11" x 17" playing area. * 70 eye-popping, jaw-dropping, 1/2" counters, representing the men, leaders, horses, and canons that fought March 15th, 1781 near what is today called Greensboro, NC. * The game has been significantly improved since its debut in Armchair General. New and improved rules. 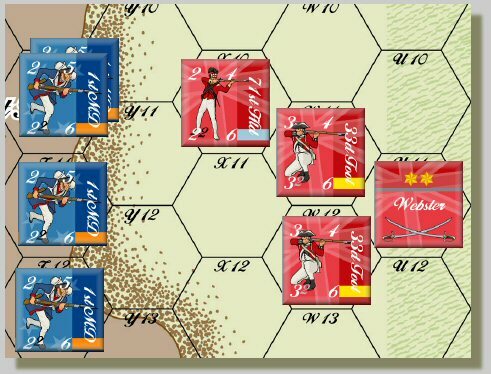 The game now simulates close-range musket fire, shattered formations, altered turn sequence, cavalry modifiers, and much more. There's even a revised fire table and a BRAND NEW beginner's scenario. * All this in only four pages of rules. Read, print, and play in less time than it takes to set up most other games. The Battle of Guilford Courthouse occupies a unique place in American history. It is one of the least well known, yet most influential battles, ever fought by our soldiers. Nathan Greene’s tactical defeat in the bare woods and muddy fields of North Carolina heralded a strategic triumph that would eventually lead to Cornwallis’s retreat, encirclement, and surrender at Yorktown —an event that signaled the end of armed conflict in the freshly born United States of America. 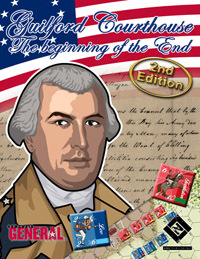 Guilford Courthouse: The Beginning of the End is a substantial improvement of the game that originally appeared in the Armchair General. Counters represent the companies, leaders, and batteries that fought on that longest day in Greensboro, North Carolina. Each hex is 40-60 meters and each turn 15 minutes. We are truly excited about this one. Gone are the cumbersome formation activations. Guilford Courthouse’s streamlined play will have you leading charges in no time. Leaders still matter, formations must stick together, and all the detail we love is present in just four pages of rules. There is weapon differentiation (Those muskets don’t shoot too far, do they? ), unique units (cavalry works better in the open), shattered regiments, and fleeing militia, to name just a few of the changes. A unique sequence of play (Rally, Fire, Melee, Move) captures the feel of interactive combat without all those tedious nouns, adjectives, and passive-voiced sentences. Melee can cripple a company, and losses can shatter a formation. All this in only four pages of rules. Download it now, or maybe later this afternoon, and see what we mean. This complete downloadable PDF game features the beautiful art of Nicolas Eskubi, and can be printed and played in less time than it takes to watch a scoreless half of soccer. Fun, simple design, drop-jaw graphics, and no shipping! It’s a wargamer’s dream.